Rand Paul: "It's Hard to Square the Idea of a Pre-emptive War with Christianity." 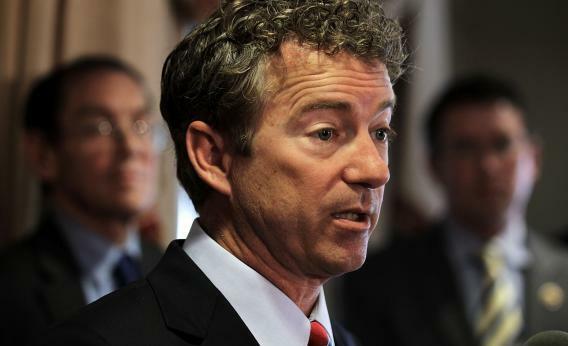 Rand Paul’s on the winning side of a foreign policy debate, for once. A week or so ago, Sen. Rand Paul was absolutely against airstrikes in Syria and worried that he’d lose. In interviews he’d say airstrikes had “a 50-50 chance” of success in the Senate, which isn’t loaded up with Republican war skeptics like the House is. Media organizations launched whip counts to see when and whether the resolution would crack 50 in the Senate, or 218 in the House. Actually, the 50-50 chance thing might have been too optimistic for the hawks. After the Russians intervened and suggested that Syria could give up its chemical weapons, the momentum halted; the New York Times even stopped its whip count at 29 Senate “no” votes, on a day when a series of Republicans were to join the party. I heard all week that the Senate GOP, which had voted en bloc for the Iraq War, was almost universally opposed to new airstrikes. If you didn’t see a Republican endorsing this on TV—i.e., McCain, Graham, Corker—he wasn’t for it. Paul won, again. In an interview with McKay Coppins, he describes what President Obama told Republicans at their Tuesday luncheon to demonstrate why it didn’t sell. “[He said] that we’re not facing very many direct threats in this world to the United States … and so you’re going to have to be involved in much more ambiguous situations,” said Paul, who also took the chance to criticize the very philosophy of right-wing interventionists. Some within the Christian community are such great defenders of the promised land and the chosen people that they think war is always the answer, maybe even preemptive war. And I think it’s hard to square the idea of a preemptive war and, to me, that overeagerness [to go to] war, with Christianity. So, contrast that with the bottom story of the week: New York Rep. Peter King announcing that he really does want to run for president, to take the wood to Paul. Sure, OK—how does he stop it? It was easier to dismiss the libertarians when they were making a theoretical argument about drones killing Americans. * Now Paul, aided by the intervention of the Russians, has been on the winning Republican side of a vote against foreign intervention. *I realize this has, in fact, happened, but the scenario Paul drew up of an American in this country being droned has not happened.